Canadian Bacon is an American term for a lean cut of cured back bacon. The lean-cut back bacon that Americans call “Canadian” is the standard cut of bacon in Britain and Ireland. In America and Canada, the predominant style of bacon is Side Bacon, with streaks of fat in it, which the British and Irish call “streaky” bacon. Some people say Back Bacon is cut from the back; others say it is cut from the loin. They are both right, as the loin joint on a pig runs across most of the back. Specifically, though, it is cut from muscle on the back on the pig. It is very lean, with a thin layer of fat on one side. Other than that, there is no marbling of fat present in the meat as there is with American style (“streaky”) bacon. If you order breakfast, or a bacon sandwich, or go shopping for bacon anywhere in the UK or Ireland, this is the bacon that you will see on offer. In Canada, the UK and in Ireland, Back Bacon is cured, then made available to consumers smoked or unsmoked. 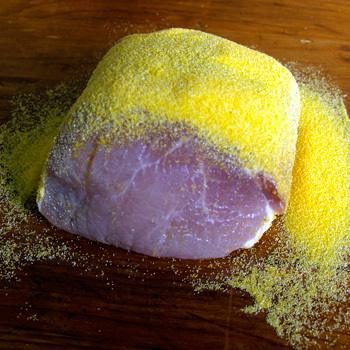 Peameal Bacon is made primarily in the southern part of the province of Ontario, and is not all that readily available in other parts of the country. Apparently, it’s only people in that province who tout it as an all-Canadian food. In any event, Peameal Bacon is Back Bacon that has been cured in brine and sugar, but never smoked. After curing, it is rolled in meal to help preserve it. The meal that it used to be rolled in was ground yellow peas (hence the name, Peameal), but over the years this got replaced by cornmeal, so in effect, Peameal Bacon would be better called Cornmeal Bacon to keep up with the times. The bacon is pink to pale red. Peameal bacon is raw, and must be cooked. You can buy it already sliced, or buy whole roasts of it, to slice yourself or roast as is. Some American stores offer Cajun Spiced Peameal Bacon, which would make any Canadian pause. Fry peameal bacon slices in butter or oil for 2 to 3 minutes per side. While it’s true that Canadian pigs, particularly in Ontario, used to be fed on a diet of peameal hash in the 1850s, this is not where the name comes from. And even though by 1900, Toronto was shipping over 400,000 pork carcasses a year to Britain, the British did not call it Canadian Bacon. It was just processed as per normal British cuts, with the cuts being called the relevant names. During the same period, Britain also imported a great deal of pork from Ireland, processed in the same way once it arrived. Rector, Sylvia. Your old pal Canadian bacon probably isn’t. Detroit Free Press, 2 April 2002.